Our Work - Z Systems, Inc. The University of Minnesota Raptor Center, part of the College of Veterinary Medicine, is world-renowned for medical care, rehabilitation, and conservation of birds of prey. When they needed a video system for their remote learning program, they chose Z-Cart by Z Systems - An HD mobile video production system. Fabricating orthotic and prosthetic devices is a technically complex and precise process, as is teaching these skills. The instructors in the nationally recognized Orthotics and Prosthetics (O & P) program at Century College knew they needed to significantly improve the quality of their instructional videos, but had no idea how. That’s why Century College staff hired Z Systems to bring our expertise to design and build a custom mobile video production system. 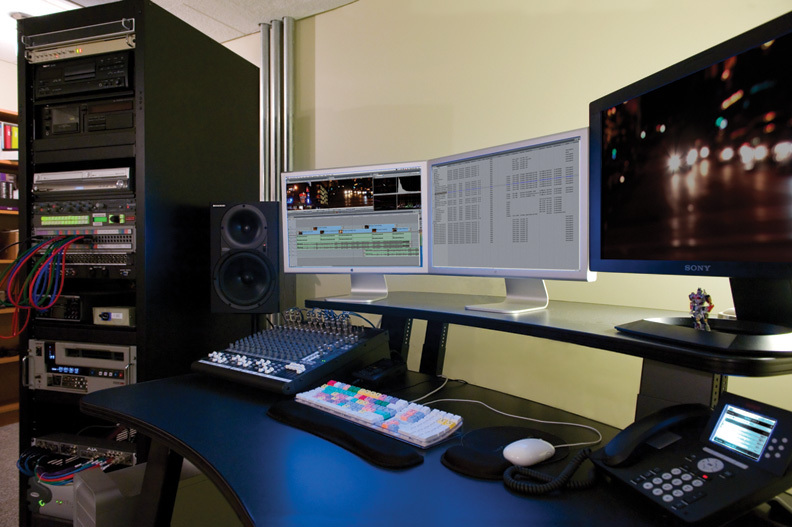 Z Systems has been servicing the edit suites of Best Buy’s corporate video department, Yellow Tag Productions, for nearly 10 years. Yellow Tag called us when it came time to replace their edit systems, upgrade to HD, interconnect their two suites, and refresh the wiring to their 15 video decks. They needed to accommodate many different tape formats — without the luxury of a separate equipment room. We hid nearly a mile of audio and video cabling in the main edit suite, while still maintaining a welcoming corporate environment. Brody Howard founded “ditch.” in 2007 as a boutique offline edit facility. He wanted a suite that allowed open communication with clients/producers — he didn’t want the technology to get in the way of the creative process. 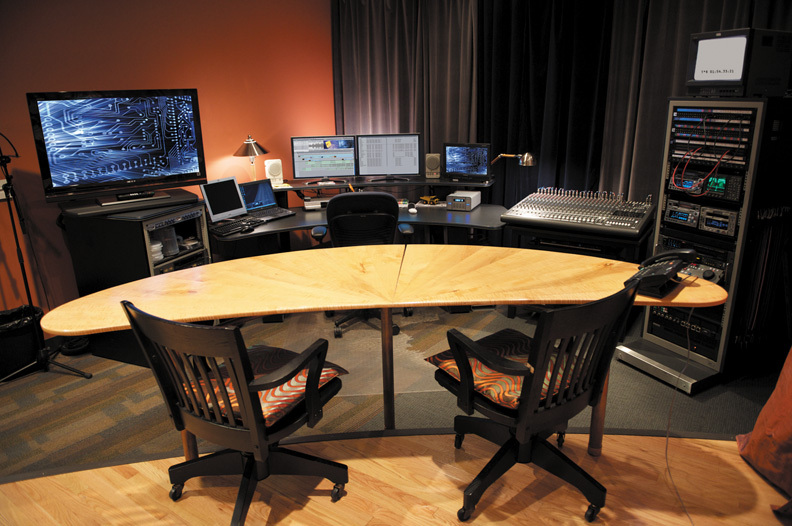 We worked with Brody to install a high-performance Avid system that blended into the room, allowing natural communication between editor and client. We modified a monitor mount into the “low-rider” configuration pictured, and then installed the computer, Avid hardware, and decks in a separate equipment room across the hall. Since then, we have helped Ditch add a second suite using the same shared equipment. Fischer Edit has been a client since the founding of Z Systems. Fischer planned to move across town, and they presented us with a unique challenge: go offline end-of-business the Friday before Memorial Day, and be back up and running in the new location by the end of the weekend. We installed Fischer’s new 64×64 multi-layer HD/SD routing system (with fully redundant patch bays) to support 15 decks and 16 offline, online, support, and VFX suites. After some late nights for everyone, the deadline was met — while upholding the quality wiring, organization, documentation, and testing for which Z Systems stands. Elite advertising agency Carmichael Lynch turned to us to outfit their new space when they moved in 2006. They went from makeshift edit suites and disjointed equipment to a modern, efficient, and seamless post-production environment. Working closely with the architects, we designed two edit suites, an audio suite, and an equipment room that were ideal for their needs. We engineered and wired an “anything to anything” HD routing system with a master equipment/dub room. We installed fully-integrated dual-boot Final Cut and Avid edit systems all collaborating via high performance Avid Unity shared storage.